Here’s a nifty little offering from Punch Equipment®. 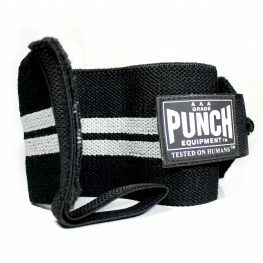 It is the classic heavy duty Wrist Wraps / Straps. They’re available in pairs and they have a little thumb loop. They can be used just like a hand wrap for supporting wrists. Now, a-lot of people when they’re boxing do tend to sprain their wrist or have a weak wrist that gives them pain. This is a great little item that you just wrap around your wrist. It acts as a great sweat absorber. It’s very quick to put on and off. It can also fit inside a boxing glove. The strength and support this wrap gives your wrist is simply amazing! The tension is never loose or tight, so it’s very comfortable. It comes with a 3-inch elastic closure and this is really high quality elastic. For very little expense, this product can greatly improve the support of your wrist, which is far beyond compared to a hand wrap. So if you’ve got any type of wrist problems, we would highly recommend this wrap.